When cinema first appeared at the end of the 19th century, there was a huge debate as to whether it could be considered a valid art form or just a rather gimmicky form of sideshow entertainment. One of the first countries to whole-heartedly embrace the new medium as “the seventh art” was Hungary (doing so even before France came to this conclusion). Cinema’s early status as a distinct art in Hungary guaranteed that it was taken seriously as a means of expression, which in turn meant it attracted the attention of artists working in other areas who recognised the new medium’s potential as Gesamtkunst—an art form that combines all others. A lot has changed in Hungarian cinema in the past 100 years. This has particularly been so in the 14 years since Hungary opened its border with Austria in an event that would help contribute to the fall of Communism and the conversion of the country (including its film industry) from a planned economy to free-market principles. Yet, despite all this, the 34th Magyar Filmszemle (Hungarian Film Week) still showed that, in diverse ways, film directors in the country are still very much influenced by other art forms when creating their cinema. Music, opera, dance, theatre, literature and fine art were widely present as integral elements to the film. The most obvious film to encapsulate the principle of Gesamtkunst was Ferenc Grunwalsky’s Táncalak (Dancing Figure, 1998-2002). An extraordinary symbiosis of the modern dance of Andrea Ladányi, the music of György Kurtág, the graphic drawings of István Nádler, the poetry of Ottó Orbán and Grunwalsky’s own talent as a director and cinematographer. Kurtág’s music is increasingly internationally famous, yet his atmospheric music has until now not been heard on film soundtracks—the composer has forbidden it, not wanting his compositions to become mere “illustration”. However, Kurtág was so convinced of the merit of the project (based on a series of 1000s of preliminary still photographs taken by Grunwalsky) that he gave his consent. As the title suggests, the focus is primarily on Ladányi and her combination of classical and experimental dance techniques in a series of abstract tableaux that cast the alienation of modern life into bodily form, with dramatic lighting and Nádler’s simple line drawings accentuating the physical space Ladányi occupies. Between these scenes, we see archive footage of atrocities of the 20th century: a man being shot, another being hanged. Táncalak is clearly a “dance film”, something that may put some people off from the beginning, but its visual style and its exploration of the metaphysical dimensions of being a body in space are sufficiently strong to overcome the limiting label that will inevitably be applied to it. The few dance-orientated critics who did attend the press screening at the Film Week, though, were clearly rapturous about the film, insisting it should become required viewing at dance colleges, and the film is likely to have a parallel distribution on the dance festival circuit as well as through film outlets. Another highly respected Hungarian director, Attila Janisch (who made Hosszú alkony / Long Dusk, 1996), also turned to Hungarian modern dance as a subject matter, with his 26-minute documentary portrait Bozsik Yvette (Yvette Bozsik, 2001). Janisch admitted to the press that he’d kept his personality out of this made-for-TV review of Bozsik’s career, which is left to stand on its own. Yet archive footage of Bozsik’s dances (including eating a placenta-resembling substance while locked in a glass box covered in spray paint) are remarkable enough. Grunwalsky also had a major role in two other films at this year’s Film Week as director of photography, both of which carried on from long-standing collaborations. 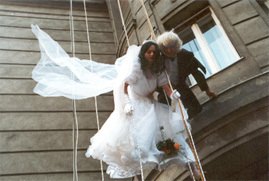 Although directed solely by Miklós Jancsó, the film Kelj fel, komám, ne aludjál (Wake up, Mate, Don’t You Sleep, 2002) is billed as a film “by Miklós Jancsó, Ferenc Grunwalsky and Gyula Hernádi”, the latter collaborator being Jancsó’s near-constant scriptwriter for over 40-odd years, as well as a respected novelist in his own right. The joint credit is a testament to the degree to which Jancsó’s views filmmaking as a collective process, an ironic under-cutting of his status as an “auteur”. Kelj fel is the fourth film in a series made by the trio and the fourth to star Péter Scherer and Zoltán Mucsi as Pepe and Kapo respectively. In the original film, they were a pair of clueless gravediggers who try (and fail) to make sense of Budapest’s post-Communist socio-cultural landscape (which they seem to live in rather than the city itself). In the new film, made as an indirect response to rising right-wing nationalism in Hungary, the pair are reincarnated as a pair of Second World War Jewish prisoners who again inhabit a modern-day abstract sphere, this time that of Budapest’s contemporary socio-historical awareness. The film also has a significant role for András Lovasi, lead singer and guitarist for the band Kispál és a Borz. Lovasi extends the role played by folk singer Tamás Cseh in the director’s historical films of the 1970s by providing musical interludes to the action, which Jancsó has compared to the role of the minstrel in the work of Shakespeare and strongly recommends those who watch the film to pay attention to the lyrics. Additional music from Hungary’s top rock troublemakers Bëlga and Burzoá Nyugdíjasok (literally “the unemployed pensioners”) add to the post-modernist melange of social comment and irreverent fun. It’s an unnervingly fresh and anarchic film to watch when you consider the director is now in his 80s. The other film with a Grunwalsky connection was György Szomjas’s Vagabond (2002). Szomjas has a long-standing interest in the underbelly of society and its victims, and here he takes on the story of a boy who runs away from an orphanage and stumbles into (the unusual combination of) crime and folkdancing. The former of these he seems to be marginally competent at and in the latter he is really quite talented. He tries to give up crime to focus on becoming a drummer. But just when it seems an honest and perhaps successful career might be just around the corner, his past catches up with him. Vagabond is neither dramatically or narratively stunning (as earlier films by Szomjas have been), but the incorporation of original Hungarian folk music and dance does add a level of enjoyability to what otherwise would be a depressingly bleak work of social realism. Two films this year drew on opera (the art form for which the term Gesamtkunst was first coined, by Wagner). Most obvious of them was the government-financed super-production of Bánk Bán (2002). Despite it being Csaba Káel’s first feature film, he was let loose with USD 3 million, at a time when state handouts for filmmaking are thin on the ground. 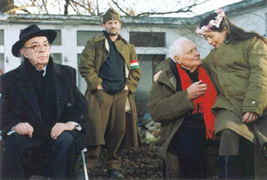 Disgruntled filmmakers complained that Káel had got the work as he is close to the administration that handed out the money (similar accusations were levelled at A Hídember / The Bridgeman, 2002, directed by the more experienced Géza Bereményi). The screening I attended was packed as people were eager to see, as a Hungarian journalist informed me, where all the money had gone. Certainly, there was little evidence of the film’s enormous (for Hungary) budget on screen, and the resulting work was very un-cinematic. In marked contrast, though, was Kornél Mundruczó’s A 78-as Szent Johannája (Joan of Arc on Route 78), the fifth and final section of the otherwise unremarkable omnibus feature Jött egy busz… (A Bus Came…, 2002), designed to showcase the talents of Hungary’s 20-something directors. Starting with the visual appearance of a gory documentary into a road accident involving a bus, the 22-minute film moves onto a hospital where twin shocks await the audience. Firstly, the accident was just a mock-up for the emergency services to gain practice, and secondly the film flips out of the genre pigeonhole the viewer initially places it into as the protagonists break out into operatic song. Peeling off their wounds, they complain about trials and tribulations of everyday modern life. Not only is the film witty and observant, it also is, unlike Bánk Bán, genuinely a film and not a piece of theatre masquerading as something else. For his latest feature, Magyar szépség (Hungarian Beauty, 2002), Péter Gothár, like Jancsó has been doing for years, has worked with an established novelist, in this case Pál Závada. Despite this, the primary influence is not from a book, but another film—Sam Mendes’s acclaimed American Beauty (1999). Whereas Mendes paints a portrait of America through specific character types, Gothár and Závada (who worked on the script together) uses roughly the same plot but different characters within it to paint a portrait of contemporary Hungary. Gothár at a press conference was clearly on the defensive and reacted tetchily to anything that might be construed as criticism of the film. He also seemed curiously reluctant to admit that the film was based on that of Mendes, although that may be for legal reasons as there have been predictable disputes over copyright. He did, though, say that he thought that every country could make a film like this, and he saw no reason why there shouldn’t be a ‘Russian Beauty’ and a ‘German Beauty’ and so on. In all, it is an ambitious project, and one that has resulted in a dense and highly literary work. Certainly, it is very Hungarian and un-Hollywood, particularly since the fatal ending is not given any resolution in Gothár’s version. Moreover, despite the obvious borrowings of plot elements from Mendes’s film, this is clearly not a re-make in any traditional sense of the term. Sadly, the fate of the film for the immediate future remains unclear. It cannot be shown in Hungary on theatrical release until legal disputes over royalties are settled. It can, however, be shown at festivals (since the producers will not be making money off these showings). It is not clear, though, how interested international festival-goers will be in this highly culture-specific film. Another film that also might find it hard to survive the international festival circuit is Libiomfi (2003), a “tragicomical socio-musical-tale” by Zsolt Végh and Zoltán Kálmánczhelyi. Here the influence is theatre and a disturbing incident from the headlines: a deranged theatre director who strangled several people in the course of an acting workshop. This gruesome tale is here fictionalised in the form of an equally barmy director who wants to stage a bloody and emotionally raw version of Winnie the Pooh. The international press walked out in droves during the screening, but at a public showing I attended the Hungarian audience was in hysterics. Which just goes to demonstrate the problems of exporting humour. Worth mentioning here is that Libiomfi was produced by Inforg Stúdió, which is one of a number of private studios that seem to have taken over the role of the formerly distinguished Béla Balázs Studió as the prime producer in Hungary of experimental works by young directors. Béla Balázs Stúdió, named after one of the early pioneer film critics who helped promote cinema as an art (as well as being a recognised poet who wrote libretti for Bartók), is now almost dead and this year there were no films showing at the Film Week that it had produced. Even when the arts aren’t incorporated directly into the film, many features chose to put artists as principle characters in their stories. Thus, Boldog születésnapot! (Happy Birthday!, 2003) is about a music teacher, Szent Iván napja (Saint Ivan’s Day, 2003) focuses on a rock star working in a cabaret show, A Szent Lõrinc folyó lazacai (Salmon of the Saint Lawrence River, 2002) uses fine art to explore one of the principle character’s personalities, A Boldogság színe (The Colours of Happiness, 2003) is largely set around an art gallery, and the plot of A Rozsá énekei (Rose’s Songs, 2002) is driven by a mysterious opera singer. As is happening globally, the soundtrack is now a particularly important part of a film. Thus, Rinaldo (2003) drew on orchestral melodrama to emphasise the film’s indebtedness to westerns; Tesó (Bro’, 2003) used the central character’s geeky mania for music to the full; Károly Makk used a haunting jazz score by László Dés to add atmosphere to Egy hét Pesten és Budán (A Long Weekend in Pest and Buda, 2003), his loose sequel to his 1971 masterpiece Szerelem (Love); and Sobri (2002) employed music played on period instruments to enliven its tale of early 19th century banditry. Even in animation the presence of other arts makes itself felt. One of the most enjoyable experiences of the Film Week for me was Evá M Toth’s Animare necesse est (2002), a series of six 15-minute portraits of landmark Hungarian animators copiously illustrated with snippets from their works. Whereas Western animation has been dominated by Disney, behind what was once the Iron Curtain the influences were more likely to be fine art, literature and philosophy. One of the featured directors, István Orosz, even denied he was an animator, as he felt himself to be more part of the graphic art tradition. Sándor Reisenbüchler, on the other hand, spoke of the influence of Jules Verne, while his animations show he has a deep understanding of art history. Marcell Jankovics, whose Fehérlófia (Son of the White Mare, 1981) was once voted one of the 50 greatest pieces of animation by a group of LA film critics, bases much of his work on folklore and mythology, but in a far different manner to which Disney received inspiration from fairy tales. Toth’s documentary series is a fascinating tour of a treasure trove of masterpieces in European film history, and it will awaken in anyone who watches it a burning desire to see more of the work of these remarkable artists. Regrettably, Hungarian animation (and Central European animation generally) is all too little known. Which makes it all the sadder that when the lights went up at the end of the Film Week press screening of Animare necesse est, I found I was there only person there. Hungarian film is still struggling to find its feet in the post-Communist world and does not have the international acclaim or the domestic box office success of the Czech Republic or Serbia, the most successful countries in the region. Despite the fact that major directors such as Jancsó and Gothár collaborate with other talented artists in order to produce their works, the young generation seems stuck on the auteur theory of filmmaking that sees the director as the supreme artist. Thus, of the ten feature films by directors under the age of 40 that showed in competition at the Film Week, eight had the screenplay written entirely by the director, one was co-written by the director and the other was the previously mentioned omnibus film Jött egy busz…, which had three of its five segments wholly scripted by the respective director. Where, one has to ask, have all the scriptwriters gone? Perhaps in this respect, the connection with Gesamtkunst as well as explaining what makes Hungarian cinema interesting also accounts for some of its weaknesses. “Everybody has to be an auteur; everybody has to be an artist,” as Jancsó has said about the young generation of filmmakers. Maybe young Hungarian directors need to forget about the artistic pretensions a little and just concentrate on making films.